Paper honeycomb globes look great as room décor and in garlands, but how about making a Honeycomb Half Sphere to use as wall art or a present topper? Keep reading to find out how easy it is to make your own paper honeycomb. Take your pack of tissue paper and stack the sheets on top of each other. Fold the stack in half, then fold in half another two times until you end up with a rectangle. You want to end up with lots of individual sheets of tissue, so the edges of the folded stack will need to be cut off. Take the ruler and craft knife and cut about 0.5cm off of each edge. You’ll need at least 25 small paper rectangles. If you don’t have enough, just cut some more! Measure the width of your tissue paper rectangle, and draw a line of the same width on your scrap paper. This will be the guide for making your glue lines. 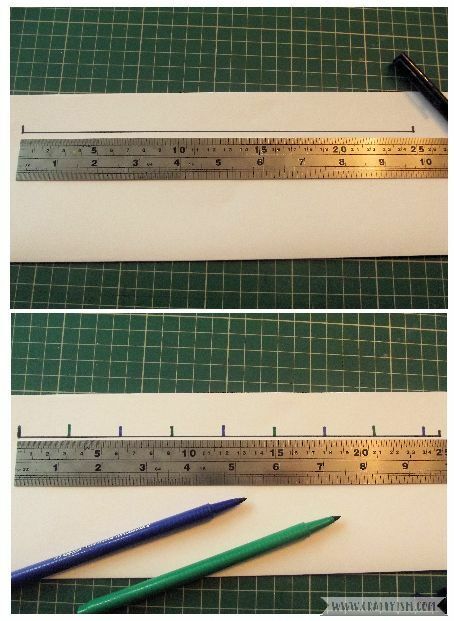 Place your ruler at the start of the line and make a mark at 3cm with a green pen. At 6cm, make a mark with a blue pen and at 9cm make a mark with the green pen. Continue along the line, marking every 3cm in alternate colours. You can of course use any colours of pens! I marked every 3cm as it was the best fit for my line measurement. You can change this to suit your project. Marks at more than 3cm would make a larger, more open honeycomb, whilst a smaller measurement would make a tighter honeycomb. Place one of the tissue paper rectangles under the marked line you have just drawn. Take a glue stick, and at every green marker, draw a vertical line down the tissue. 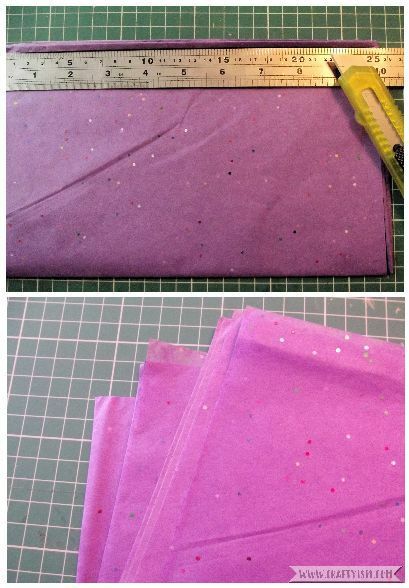 (see the top photo) Whilst the glue is still wet, place another tissue paper rectangle over the top of the first. Now draw more vertical glue stick lines, this time at every blue marker. I also added a line on the left edge of the tissue which I will repeat on every blue layer. Repeat this process, layering up the tissue and switching between gluing at the green and blue markers using up all of the tissue paper rectangles. 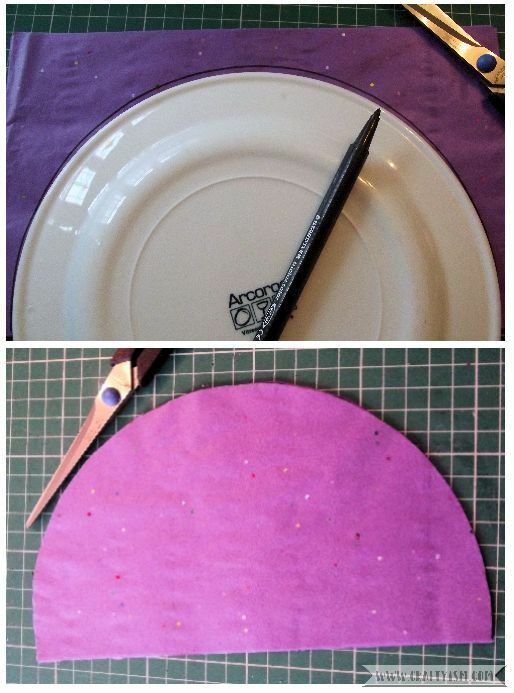 Once all the glue has dried, take your plate or circle template and place it on your tissue paper stack. Draw a half circle, trying to make sure that it starts and ends on a glue line. Cut out your half circle. You will now be able to open up your honeycomb, but it’s kind of flimsy. To fix this, trace two slightly smaller half circles onto a piece of card. Cut these out and use the glue stick to stick one piece of card onto each side of your tissue paper honeycomb, lining up the straight edges. When this glue is dry, stick two strips of double sided tape onto each piece of card. To open up your Paper Honeycomb Half Sphere, use the double sided tape and stick one side of the card to a flat surface. Grab the edge of the piece of card that’s facing up and flip it down so that it is also stuck onto the flat surface. 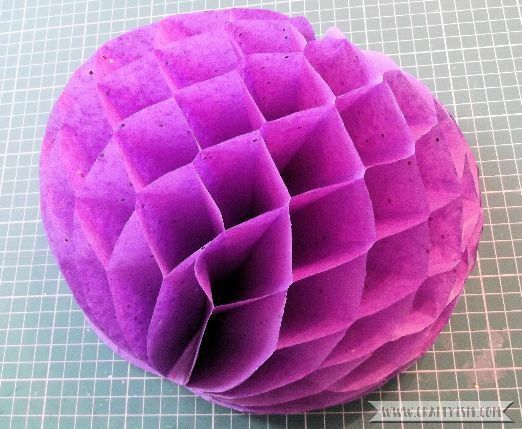 Your finished Paper Honeycomb Half Sphere would look great in a box frame or on a canvas. They are also really fun to decorate presents instead of a bow! Let me know how you would use your Paper Honeycomb Half Sphere.